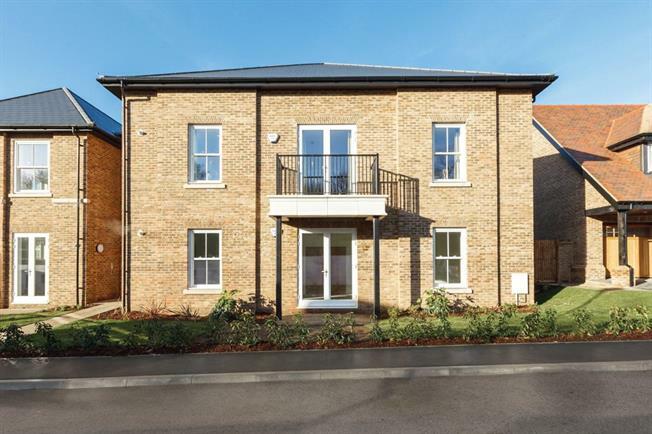 1 Bedroom Flat For Sale in Hertfordshire for Offers in the region of £584,950. HELP TO BUY OR WITH STAMP DUTY PAID ON SELECT PLOTS (speak to an Advisor for T&Cs). An exquisite collection of high specification new and refurbished 1 & 2 Bedroom apartments and 3, 4, 5 & 6 Bedroom houses by Crest Nicholson. These exclusive homes are nestled on the edge of a greenbelt area in the sought-after location of Bushey and positioned opposite St Margaret’s School. KITCHENS - A fully-fitted kitchen combines attention to detail with the highest quality materials and finishes: Alno kitchen with Silestone worktops, splashbacks and upstands, Soft close doors and drawers. Siemens integrated single oven, four-ring induction hob, fridge/freezer, dishwasher and feature chimney hood, washer/dryer, Quooker hot water tap and wine cooler, Low energy LED lighting under wall units, Stainless steel under mounted sink with Hansgrohe block mixer taps. BATHROOM, ENSUITE AND CLOAKROOM - Villeroy and Boch Omnia Architectural sanitaryware with Hansgrohe taps, Full height Porcelanosa tiling to the bathroom and ensuite, Half height Porcelanosa tiling to the cloakroom, Heated chrome towel rails in the bathroom and ensuite, Mirror to bathroom and ensuite, Vanity units to bathroom and ensuite. JOINERY – Oak veneer internal doors, Satin chrome ironmongery, Full height sliding wardrobes to Bedrooms 1 & 2 in 2 Bedroom apartments and to the Master Bedroom in 1 Bedroom apartments. and Cloakroom. Carpet to all other areas. ELECTRICAL - Low energy downlighters fitted to the Kitchen, Bathroom and ensuite. Pendant or batten light fittings to all other rooms. Sonos sound system with two ceiling speakers in the Living room, Master Bedroom and Kitchen. Controlled by iPad/iPhone app (not supplied by Developer). TV/FM/Sky+ connections fitted in Living room and Master Bedroom (subject to subscription). Shaver sockets fitted in all Bathrooms and Ensuites. White recessed extractor fans. SECURITY AND PEACE OF MIND - External doors supplied with chrome ironmongery and multipoint locking system. PVCu glazed windows and French doors provided with matching white ironmongery and multipoint locking. Mains operated smoke, heat and carbon monoxide detectors fitted. Security alarm system to be installed. Door entry phone system. ENVIRONMENTAL FEATURES - Double glazed windows. Enhanced insulation. Pull out recycling bins in Kitchen. Low energy lighting throughout. A rated Kitchen appliances (excluding washer/dryer). To arrange an appointment to view, please contact Preston Bennett New Homes on 020 8954 8626. While Bushey is within easy reach of central London, the area retains a rural village atmosphere, with its boutique retailers, elegant eateries, traditional pubs and quaint cottages. The majority of amenities can be found on the High Street and residents living here will also have facilities on their doorstep, including The St Margaret’s School Sports Centre. This modern sports facility is just a stone’s throw away and has a fully equipped fitness centre and a heated 25-metre luxury swimming pool. The charming High Street has an exclusive collection of superb restaurants, many of which are just a short distance from St Margaret’s Park. You will find a wide selection of cuisines to choose from in nearby Battlers Green Farm, which is situated in Radlett, and there are also plenty of fine restaurants in Watford. Bushey High Street is lined with independent retailers, offering everything from clothing and footwear to interior design. Radlett also has a number of stores, as does Watford, which is home to the Intu Shopping Centre and over 100 retailers. From tiny boutiques to high street favourites; there is something to suit every style.